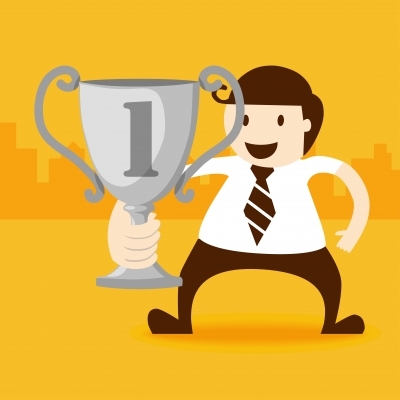 Ever wondered how prizes can be used to spur innovation? Or what sponsors can do to deliver effective prizes? Prizes are not just for sporting events; indeed, philanthropic organizations have long used prizes to encourage and reward innovation in the social sector. A McKinsey report drew on academic literature, case studies, databases of more than 300,000 awards, and a survey of prize-givers and sponsors to examine when prizes should be used and how they can be made more effective. The report, titled “And the winner is…”, presents valuable lessons on the attributes of prizes, how prizes can lead to change, and how to design them. Evaluators may wish to use this report to help them define indicators for evaluations of the design of prizes, competitions and challenges, or to determine how to evaluate influence. Unfortunately, the report does not offer insights on how to evaluate the impact of prize-giving, other than to mention that only a few prize-givers actually evaluate these impacts. The number, the value, the type and the sector in which prizes are given have changed over time as well as the type of organization that attributes prizes (the prize-givers). These changes are due to many factors including the arrival of new wealth outside of established philanthropic channels, a frustration with conventional approaches to change, different approaches to allocating risk in the development of new ideas and technologies, greater global interconnectedness through the Internet, and an increasingly multi-media and technology intensive world. Expressiveness: “Well-designed prizes carry a strong element of theater that makes them newsworthy and media friendly”. A well-designed prize, combining the aforementioned attributes, can form powerful change levers that have the potential to transform people’s actions and perceptions. McKinsey predicts a promising future for the prizes arguing that (i) there will be more activity because traditional and non-traditional sponsors will invest more in prizes; (ii) the economic productivity of the prizes will improve because best practices in delivering prizes will emerge; and (iii) there will be a better management of risks and challenges surrounding the delivery of prizes. 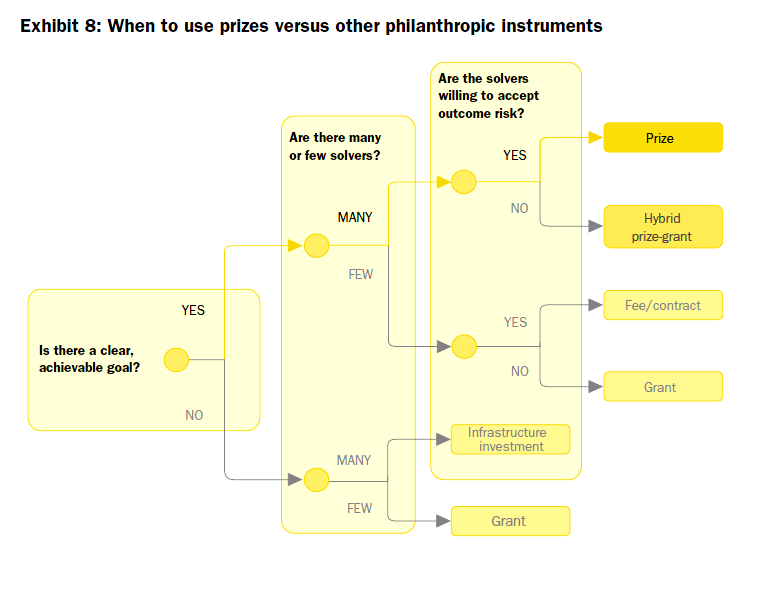 Philanthropists (prize-givers) should try to answer three questions to determine whether a prize is more appropriate than another type of instrument (grant, infrastructure investment, contract). Handled sequentially, these questions create a simple decision tree that will help lead them towards the right instrument for their goal (see Exhibit 8). Tags: innovation, prizes, reports. Bookmark the permalink. Previous post ← Special Guest Blog – Bangladesh: Out of Fragility?